I’m a little incredulous that I’m posting this right now. When I started making crème fraiche, I told myself that there was no need to make a fuss over the thing. It’s hardly a recipe—not to mention that everyone and their mother has already posted the ridiculously simple method. And then yesterday, while making a batch to accompany another recipe I’ll be sharing this week, I thought why the hell not? People, this is sincerely the easiest thing I have ever made. I’ve tried very hard to come up with something that took even a smidge less effort and I couldn’t. And because it’s so shockingly simple, it’s almost unfair how impressed people are when you pull out a jar of thick, tangy crème fraiche and tell them that you made it yourself. And just in case you’re wondering what one does with crème fraiche, I’ll give you a few applications: dolloped on fruit, smeared on cakes, dropped into soups or chili, slathered on pizza, wrapped around pasta, or licked straight from a spoon. Basically, any place you could use whipped cream or sour cream—and on everything else as well. Truly, I’m having difficulty coming up with something that wouldn’t be made better with the addition of crème fraiche. You can see how it’s almost a problem that it’s so easy to make. So, how does one make it? 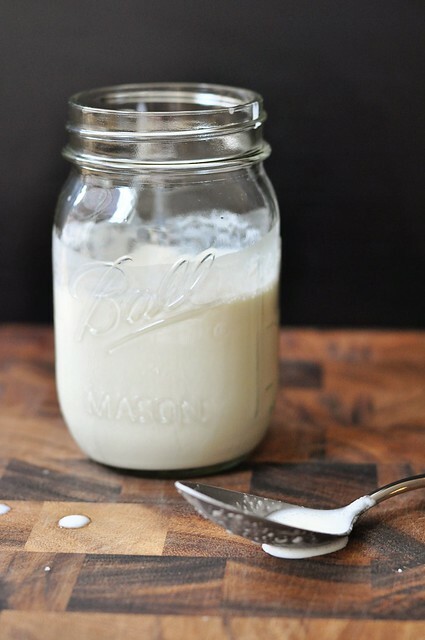 Pour a cup of heavy cream into a jar. Stir in a tablespoon of buttermilk. Lay a clean kitchen towel over the top of the jar to keep out dust and other airborne nuisances. Leave it out for 12-24 hours—the longer you let it stand, the thicker it will be. Put a lid on the jar and store it in the fridge for up to a week. That’s like thirty seconds of active prep time. How could you not make this? For those of you that like things in a more official format, I’ve written out the “recipe” below. I recommend buying a good organic cream for this. A half pint is generally cheaper than an eight-ounce container of crème fraiche and, like anything else, better ingredients equal better results. 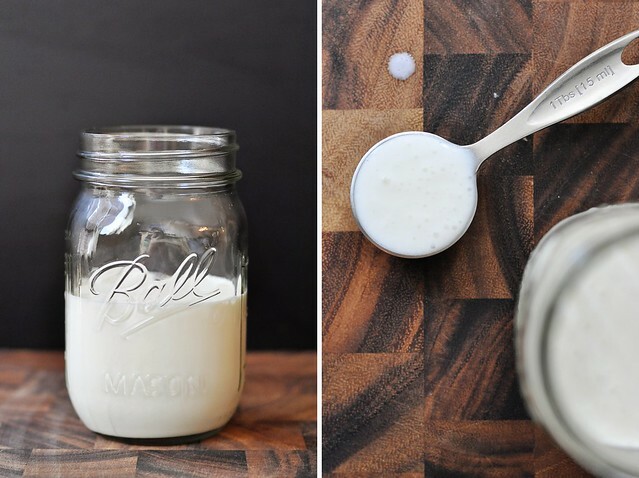 Pour the cream into a pint-sized mason jar or a container that has a lid. Stir in the buttermilk. Cover the top of the container loosely with a clean kitchen towel and leave at room temperature for 12-24 hours; it will become thicker the longer it stands. Once the crème fraiche has finished culturing, place a lid on your jar or container and move it to the fridge. It will keep for a week. TIP: You can use your homemade crème fraiche as a starter to continue making more. If you can resist eating the entire jar, combine the last couple tablespoons with a fresh cup of cream. Allow to culture at room temperature as before. Perpetuate indefinitely. *If you’re concerned about buying a whole quart of buttermilk (I’ve never seen it sold in smaller quantities), plan to make a batch of biscuits or scones as well. Both can be frozen and will bake up nicely later on. Also, I’ve read of people using lemon juice or vinegar in place of the buttermilk (sort of like the old baking trick for making buttermilk when you don’t have any on hand), but I’ve never personally tried this and am not certain how comparable the results would really be. If you try/have tried subbing out the buttermilk, though, let me know what you think. I realize this is crazy easy, but I haven’t had much success in mine setting up. I can’t wait to try your version. I really believe it’s all in how long you leave it out. I (accidentally) left my most recent batch out for more like 27 hours and it’s so thick that it holds onto an inverted spoon. Hope it works for you this time around! Has anyone tried making creme fraiche with homemade buttermilk? Great question. I’m curious about this as well…. The buttermilk that we buy in the supermarket is cultured, so I’m not sure if actual buttermilk (leftover from making butter) would work the same. I’ll look into it more, but let me know what happens if you decide to give it a try. Hi – does it work if you use powdered buttermilk? I started using that in my recipes because I was always throwing out half the quart of buttermilk. Wow–I’ve never even heard of powdered buttermilk! I see that some companies make cultured powdered buttermilk…maybe that would be good to try? This method works because of the cultures in store-bought buttermilk. It would certainly be an interesting experiment. If it doesn’t work, though, anytime I buy a quart of buttermilk I just make a ton of biscuits with the rest of it and freeze them, unbaked. It’s nice having them around to just pop in the oven. I’m really intrigued by your post. I’m going to give it a whirl and make creme fraiche with homemade buttermilk. I’ll will let you know in a few days how it turns out. Thanks for the challenge! Hello … I tried making creme fraiche with homemade buttermilk and it didn’t thicken up after sitting on the counter for 2.5 days. Best would be to stick to store-bought buttermilk. Rosa, thanks so much for trying this out! I had a feeling it might not work. I’ll bet if you made homemade cultured butter the buttermilk from that would work; it really seems it’s the cultures that they put in store-bought that make it do its thing. Sorry that your batch didn’t come out, but thanks again so much for experimenting so we could all learn! You’re welcome! It was a fun experiment to try and learn from. I’ll have to try making homemade cultured butter, but it’ll have to wait till after the baby is born (due any day now). And no worries about the batch that didn’t turn out. At least now we know. I tried it with powdered buttermilk (which, btw, I love – no more wasting all that unused buttermilk)and it WORKED great!! !1 Thanks. You can, but it isn’t recommended. Creme fraiche and sour cream will take on a different texture and/or separate upon thawing. when you need to refresh- make more and you have some of the original left, can you give me some idea on what to do? Ie= 2 cups Heavy Cream with 1/4 cup of left over home made creme fraiche? Britt, cultured “buttermilk” that we get in the store nowadays and actual old-fashioned buttermilk are two very different things. What you tried wouldn’t work on principle. Real old-fahioned buttermilk IS the liquid left over from making butter. But what is needed for creme fraiche is actually “sour milk”…it’s raw milk that’s been allowed to slightly clabber after being left out…as you can imagine, the term “sour milk” fell out of favor in American grocery stores where marketers started labeling IT as buttermilk (erroneously). They also started making it artificially, with added ingredients, sort of like the way you can “make” sour milk aka modern buttermilk with lemon juice. Raw milk will become sour milk if left out, raw cream will become creme fraiche or sour cream depending on how long you leave it out. Sara, I’m unclear as to what you’re contributing. I’d didn’t “try” anything here–I did it and it worked, several times over. It also worked for many other commenters as well as numerous other people who have used this method. As I mentioned in the original post, I didn’t make this up–I got the idea from seeing it in probably a dozen other places across the Internet. The point you’re making about true buttermilk and store bought cultured buttermilk being different things (and the fact that the former wouldn’t work here) has already been addressed in the comments. If you’re taking issue with store bought buttermilk essentially being mislabeled, I don’t really have any authority there. Or if you’re arguing that somehow the type of culture used in cultured buttermilk isn’t the same as that traditionally used to produce creme fraiche, that’s all well and good but that’s not the point of this recipe. The point is that this is a really quick and easy way to make something that tastes and functions very much like creme fraiche. If I’ve missed something, please let me know, but this method does work. I don’t make a habit of posting things on my blog that I haven’t tested out first.